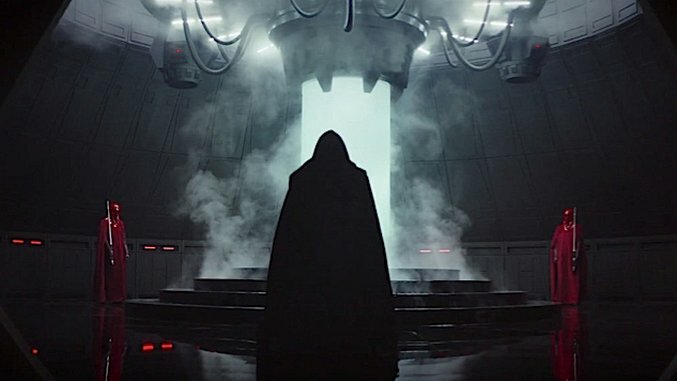 In Rogue One: A Star Wars Story, it is when the Rebel Alliance debates a strategic response to the Death Star that the organization most closely evokes the American Democratic establishment. As a relatively diverse collection of individuals talk over each other and pave minimal common ground, the Alliance ultimately cedes to the inaction that centrism and infighting so often produce. The meeting adjourns with no answer to a machine that has obliterated entire planets and populations. In an earlier meeting during which the Alliance’s leaders question Jyn Erso, they explain their desire to get in touch with Saw Gerrera, the head of a militant fringe group of the rebellion. That Gerrera is an aging black man, and that his guerrilla warriors are aliens and people of various origins, is significant. The predominantly-white brass of the Alliance, the rebellion’s principal entity, has distanced itself from the movement’s more radical and violent manifestations. But the militants can imagine no other form of resistance: beneath a blistering sun, as the Empire occupies their land and mines resources equally precious to world-devouring weaponry and a dying religion, they fight. So when the rebel fleet descends on Scarif, flying above soldiers killing and dying on beaches akin to Normandy, the Alliance bridges the divide between it and Gerrera. It is a moment in which the centrist Alliance embraces the rebellion’s extreme edges, and thereby responds to authoritarianism not with moderation, but with radicalization. Rogue One thus understands that for resistance to be effective it must refuse to settle for the middle ground. That is why interpreting the Rebel Alliance as a stand-in for the mainstream left is a trap: for the Alliance that wages war on Scarif is much different than the one that disowned Saw Gerrera. The Alliance grows and radicalizes, and in doing so succeeds. It capitalizes on the knowledge that piecemeal change is insufficient in the face of tyranny. To that end, although the Rebel Alliance has become a beacon of hope for many progressives, the Democratic establishment more strongly resembles Galen Erso, father of Jyn Erso and engineer of the Death Star. After Imperial agents locate Galen, who had been in hiding, they conscript him to work on the development of the Death Star. Galen’s daughter has managed to flee, and Galen can survive by working for the Empire—because his scientific expertise is invaluable—so he acquiesces. He navigates the system from within its confines, and in doing so contributes to the power of oppressive and deadly structures. (Literally, in the case of the Death Star.) To be fair, the Empire kills Galen’s wife and separates him from his daughter. But loss, as is evident in the death of the film’s squad of heroes, is a fixture of resistance. That Galen’s actions are understandable does not vindicate them. Galen does sabotage the Death Star, however, by implementing in it a self-destruction mechanism. But the product of his defiance is microcosmic of the inadequacy of incremental progressive change. Galen, by collaborating with the Empire (for whatever reasons and with whatever degree of subversion), does little more than nudge the next generation toward revolution. While he provides the rebels with a means of destroying the Death Star, separating its construction and its disintegration is the eradication of stars, of civilizations, and of Jyn: the daughter Galen treasures enough to build the machine that will ultimately kill her. In the real world, like in the Star Wars universe, incrementalism tends to allow disaster to flourish between changes. What the Empire represents—militaristic intervention, oppressive policing, occupation—already exists. It has existed for decades and centuries, and it is gaining new momentum with the global rise of far-right, nationalistic politics. The Death Stars of reality, among them climate change and the proliferation of nuclear weapons, have gradually been charging up. But Brexit and Trump are harbingers of worse times. They are indications that humanity cannot afford to waste whatever generations remain. Nonetheless, the Democratic establishment seems content with making patchwork improvements to systems that benefit from and fuel oppression. For instance, since the presidential election, many have urged the left to shift its focus from social issues to economic ones. But it is impossible to divorce economics from racism, sexism, homophobia, and ableism—fixing anything requires fixing everything. Calls to take care of class now and race later reveal that much of the Democratic Party’s base is less interested in resistance than it is in survival. The party, like Galen, clings to the fantasy that its children will overcome the Death Stars it tolerates. Resistance that yields fundamental and lasting reform does not wait for the Death Star’s completion. Organizations like the Rebel Alliance after its radicalization—a genuinely progressive, multiethnic coalition with women at its helm—do not materialize from nothing. They require of their members the ability and willingness to see beyond their own existences. When Cassian Andor confronts Jyn about her solipsism, he speaks to the fact that effective resistance must seek to correct the oppression not of just some, but of all. Jyn, of course, has gone through tremendous trauma. But having a non-white character prompt a white one to reevaluate her perspective on suffering and resistance is especially meaningful in the present historical moment. In contrast to Jyn and Cassian, K-2SO, a droid, does not bring emotional baggage to his relationship with the rebellion. Formerly a mindless servant of the Empire, K-2SO has been reprogrammed into a semi-thoughtful servant of the Alliance. Reprogramming, though, is not without its flaws. K-2SO disobeys orders. He negatively judges Jyn, who proves his assumptions to be wrong. He provides probabilities of survival that his friends consistently outperform. But that is where K-2SO is most valuable: he is the backdrop against which humanity’s capacity to surprise becomes clear. He is a reminder that when people emerge unscathed from asteroid fields—or topple empires—they do so despite drastically unfavorable odds. At the end of Rogue One, a soldier narrowly and improbably escapes Darth Vader to give Princess Leia the Death Star plans. His valor sets in motion a series of events that has already happened—the story of Luke, Leia, and the revolution they lead, which spans decades and galaxies and will repeat itself again and again and again. The Star Wars of old is timeless. But more relevant today, as a new resistance pieces itself together from ashes, is the image of Jyn on the sands of Scarif: seconds away from the death her father catalyzed when he put her survival before that of worlds.